Maybe you’ve noticed from my social media, maybe you haven’t, but since last August, I’ve seriously cut down on my meat consumption. Before you ask, I’m not vegan or vegetarian, but after force-feeding myself tons of protein based on bad diet advice from a trainer, I needed a break. Since then, it’s been interesting to say the least when it comes to finding creative meat-free options at local restaurants. 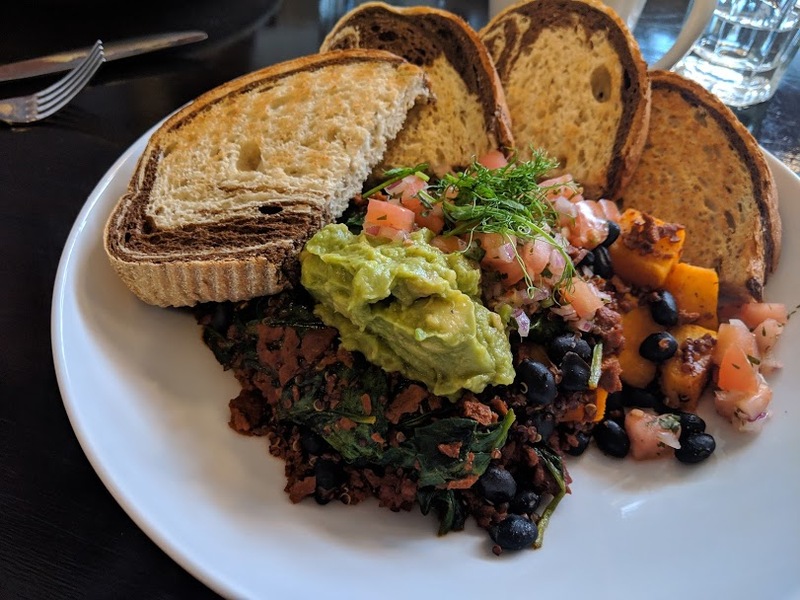 After my first visit to The Mercantile, I was surprised to see a vegan-take on a breakfast scramble, with butternut squash, black beans, spinach, quinoa, caramelized onion & soy chorizo. Served with guacamole, salsa & choice of toast ($13.95.) 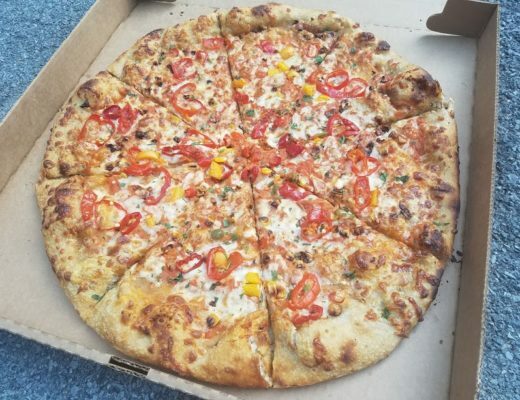 It was delicious; salty, a little spicy, and super satisfying. The next time we went in it was a little closer to lunch time, and because the vegan scramble was such a win, I figured I’d test my luck with the black bean burger, a homemade vegan burger with guacamole, roasted garlic-shallot spread, shaved iceberg, tomato, & caramelized onion. Of course, I chose to get some tots on the side, because nothing screams diner quite like fried potatoes in some form. 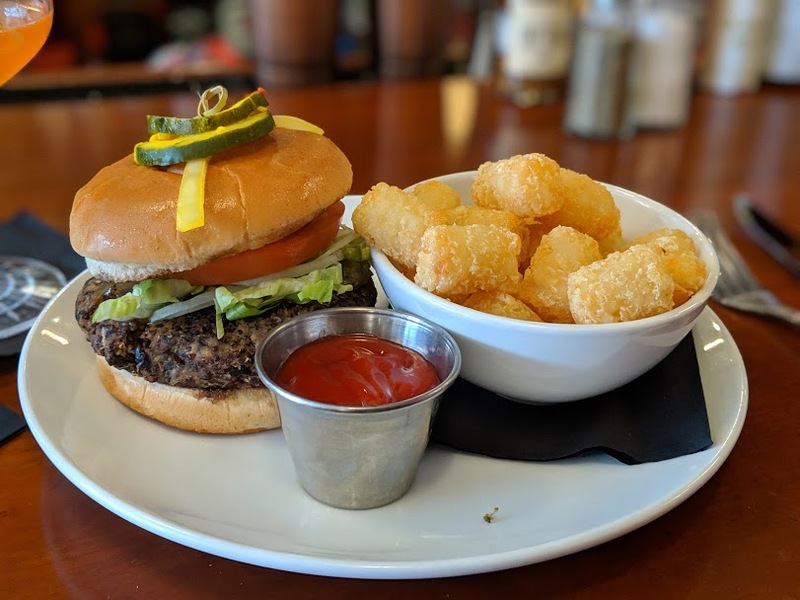 Sure, the burger was messy upon first bite, but once again, a really well-executed meatless option that filled me up and was spicy, smokey, sweet and savory. Yupp, it hit all the S adjectives. I think what makes the difference is that they make the burger in-house. It’s not one of those pre-made veggie patties that tastes like garbage and gives meatless burgers a bad reputation. While I haven’t tried anything else off the menu yet, I can tell you for certain that if you’re vegan, vegetarian or simply trying to eat less meat like myself, The Mercantile has you covered with some really great options. One more thing. The cocktails here are bomb. Co-Owner Chris Luriea has always been an amazing mixologist, so I’m not surprised in the least that the cocktail list here is fantastic. Whether you’re going for breakfast, lunch or dinner, do yourself a solid and grab yourself a drink before (or during) your meal. Hey Shawty, It’s MY Birthday!